Home. Right here in London. When you decide where you'd like to live, it has to feel like home. That's why you'll find Minto rental communities in places that feel just right, where neighbours become fast friends, and you'll be close to the things you want most. 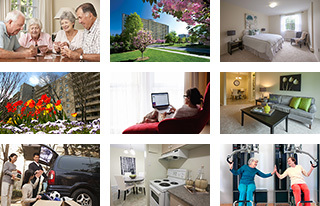 From the convenient features of our properties and their surrounding grounds, to the beautiful University of Western Ontario campus nearby, the very best of London will surround you in any one of our Minto buildings. Everything you need, everywhere you want. Enjoy a dishwasher, plenty of closet and storage space, carpeted living rooms and bedrooms, and much more. The world is within walking distance at Cherryhill. This community is close to Western University, everyday essentials and equipped with premium amenities. London's west end is where you'll find Minto Apartments' 13 perfectly located properties, including Cherryhill Village — a community within a community — and 695 Proudfoot Lane. Each property features spacious apartments, quality amenities and a warm, secure neighbourly feel close to shopping, leisure activities, transportation and medical care. The beautiful city of London is brimming with small town charm, where students, families, retirees and professionals alike enjoy great restaurants, parks and pathways, and recreational activities all year long.